Below are two death notices for Percival Leland Davis, my great-grandfather. Percy married Viola Bausman. Their son, Stanley, was my grandfather. Percy Davis, 56, died suddenly at his home in Scales Mound about 9:30 Thursday evening. He and his wife were retired from the farm and have been making their home at Scales Mound for the past several years. 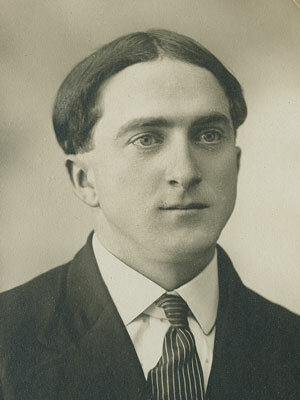 Mr. Davis was well-known in Galena. He is survived by his wife and two children, Stanley Davis and Mrs. June Harwick of near Scales Mound; two sisters, Mrs. Stella Brew of Galena and Mrs. Joseph Temperly of Hazel Green, Wis., and one brother, Laban Davis, of Scales Mound. Funeral arrangements have not been completed. The second notice is from the Freeport Journal-Standard on Saturday, April 17, 1943, page 10. Scales Mound, Ill., April 17— Percy Davis, 56, died at his home here Thursday night. 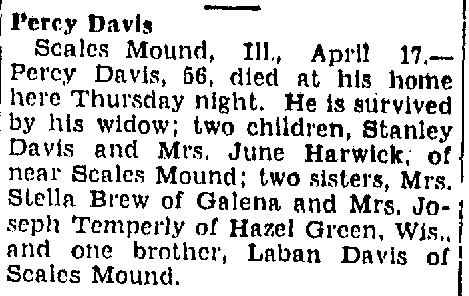 He is survived by his widow; two children, Stanley Davis and Mrs. June Harwick, of near Scales Mound; two sisters, Mrs. Stella Brew of Galena and Mrs. Joseph Temperly of Hazel Green, Wis., and one brother, Laban Davis of Scales Mound.